National Moving Group is a relocation company that was founded more than 15 years ago, and is headquartered in Florida. They act as both a carrier and a moving broker, working with partners to offer a full range of moving services. Residential moving, commercial moving, cross-country moving, packing, unpacking, and crating services, and storage in climate-controlled facilities are all part of what National Moving Group offers. They also offer automobile transport, and they offer discounts on long-distance moves. While National Moving Group does make their status as a moving broker clear on their website, they also claim that they are a carrier themselves. All customer reviews left within the past five years indicate that National Moving Group is only a broker service, and relies totally on third-party movers to perform packing, moving, and storage services. As with all moving brokers, the experience you have will depend entirely on an unknown third party, which is impossible to predict. Reviews are divided in half, with glowing reviews from many consumers, and very low reviews from others. National Moving Group seems to charge roughly industry standards for moving services, with both space and weight taken into consideration. Estimates tend to be far too low, in some cases less than half what the total price ended up being for many customers. However, even the highest prices reported were less than other competitor services. 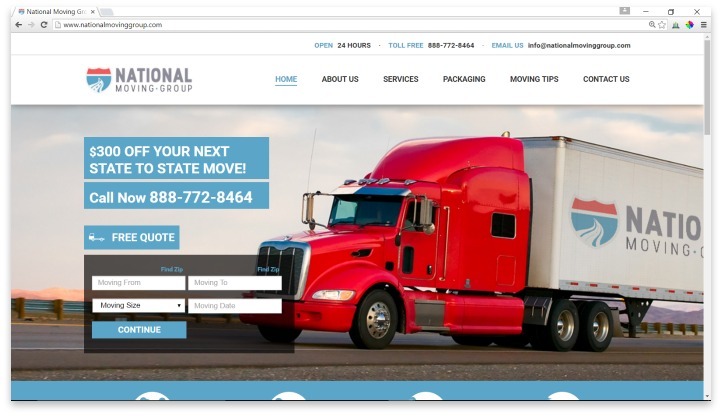 National Moving Group offers a $300 discount on out-of-state moves via their website, which helps make the price even lower than many competitors. The biggest complaints about National Moving Group are mostly related to the service provided by the third-party movers, particularly in broken or lost items, and in the customer service provided by National Moving Group after the deposit has been received. Customer service is overwhelmingly reviewed as subpar, unhelpful, and hard to get in touch with. The company does offer a 24/7 phone line, an email address, and an online contact form to reach their customer support representatives. Quotes start with an online form, but an official price estimate won’t be rendered until you speak with a customer support representative over the phone. At this time, they will help you estimate the space and weight of your household goods; keep in mind that estimates are almost always too low, and that deposits are non-refundable. This practice is standard in the moving broker company industry. National Moving Group is a relocation company that acts as both a carrier and a moving broker, working with partners to offer a full range of moving services. National Moving Group is yet another moving company that scores somewhere in the middle for trustworthiness and experience. Some customers may find that their experience with the third-party mover hired by National Moving Group is fantastic; others may find that this service becomes a nightmare, and leaves them without many recourses for lost or damaged goods. Taking into consideration the risk that any moving company presents, National Moving Group is a good option to consider if you want to keep your budget manageable, but you still want quality services like climate-controlled storage and automobile transport. If you are prepared to pay more than the estimate, and work with the movers as much as you can, you will likely find that National Moving Group is just as good as any other moving company out there. However, if you are looking for a guarantee that your items will arrive safely and on time, or that the price will be as advertised, National Moving Group is probably not for you. Have you had an experience with this company? Please share your National Moving Group reviews below.